While ideas tend to be overrated, and startup success comes down to execution more often than not, it is still valuable to have a process for coming up with ideas versus relying on an “aha” moment to occur. Ideally, you’ll find an idea that is perfectly at the intersection of your skills (where you can have a competitive advantage), your passions (so you will be excited and motivated to continue through the inevitable ups and downs), and market opportunity (taking advantage of market trends). Let’s look at a process to find this intersection. Assess what’s going on in the world, from top startup trends, global trends, market forecasts, etc. See which industries and types of companies appeal most to you, and assess what intersection(s) you might want to pursue. 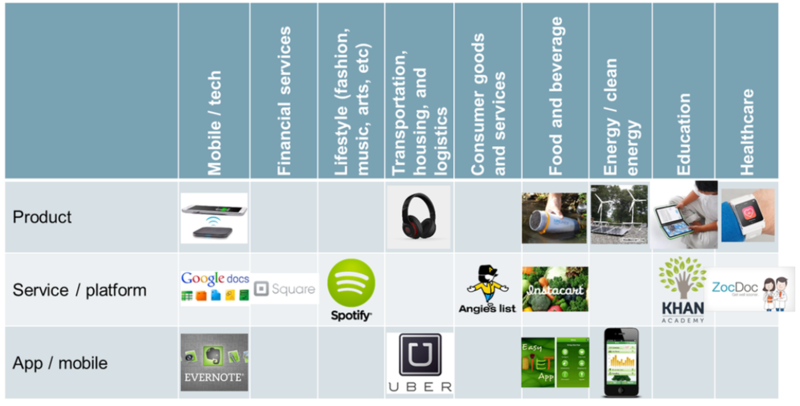 Some examples of startups in some industry and business type startups are shown below. Trends are recent developments that enable new markets to emerge, such as trends towards things becoming mobile, crowdsourcing of ideas and content, mass customization, etc. General business trends can be assessed for relevance in an industry, or specific trends in the industry can be looked up to determine how best to capitalize. Needs are ways that current customers of the market are being underserved relative to their desired conditions. A needs assessment can be used to determining and addressing the discrepancy between the current condition and desired condition. You can perform a needs assessment by listening to your customers and watching your competitors. Gaps represent opportunities to appeal to a specific niche group of customers in a more specialized way. These can be assessed by determining where certain customers are underserved in the market by not having the skills or access to current offerings. You might consider determining who the current customers are to a specific type of offering or industry, then assess the barriers to being a customer and what other customers might adopt if the barriers were reduced. Keep in mind, the idea is just the first step. There are many more, and the idea will change throughout the process, so keep an open mind! Best of luck.